This week I’ve been reglazing the wax resist trials. Half of the batch went through the kiln, the results I discussed in the previous post. With the second half, I’ve washed the glaze off, left the mugs to dry for a week and reglazed with the same glaze – but watered down to the correct consistency. The results are a little odd – patchy and blobby! I’m putting them through the kiln anyway and we shall see. It’s definitely to do with washing the glaze off. While it is the kind of thing you should avoid, it isn’t unheard of. 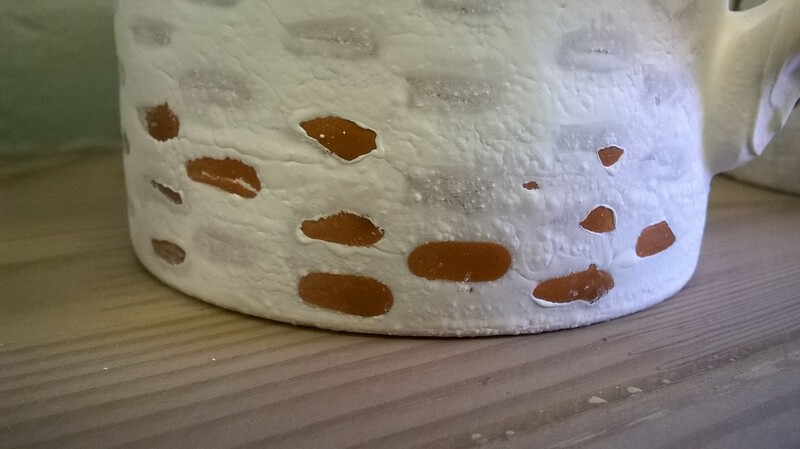 There could be a number of reasons, but undoubtedly it’s to do with impurities/dust type reasons effecting the absorption of the glaze. See below for a picture. 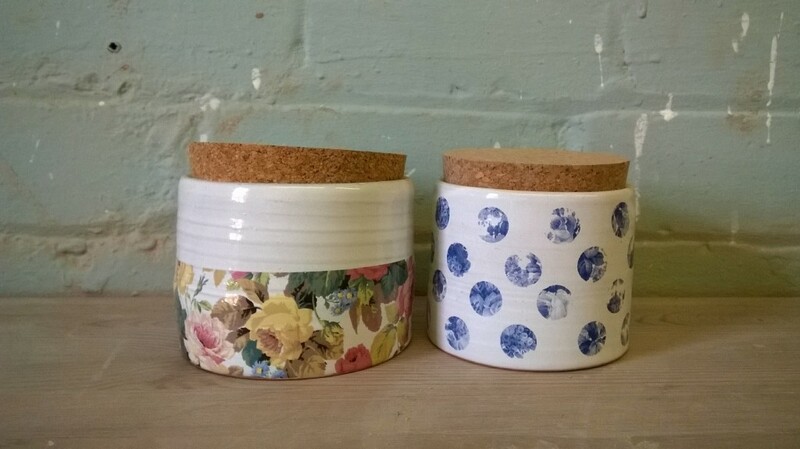 I had a bit of a rummage around the shelves of my stuff in the studio on Monday and found these lidded pots. So they’ll be available to buy from now. They were a test into doing something a bit different with the decals. Revisiting them, I think I’ll do a bit more experimenting there. In other news – I have two or three commissions on the go at the moment. I’ll consider whatever you have in mind – doesn’t have to be something that I’ve done already, so if you want something ceramicy making please do contact me, I’ll see what I can do.